Apple is celebrating the 50th anniversary of The Beatles’ American debut with a new Apple TV channel dedicated to the legendary rock group. 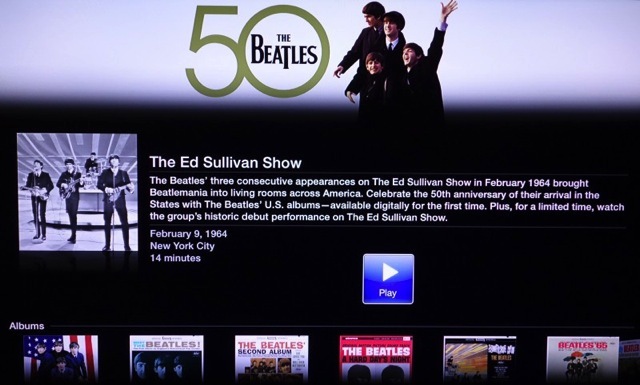 As noted by MacRumors, users can view The Beatles’ historical performance on “The Ed Sullivan Show” on the new Apple TV channel for a limited time. In addition, The Beatles’ Apple TV channel offers download links to the group’s U.S. releases, which are available digitally for the first time on iTunes. Steve Jobs, who was a big fan of The Beatles, something he confessed to Walter Isaacson in his biography, used to own 7 albums from the band on his iPad. Their music first came to iTunes in 2010, selling 2 million songs and 450,000 albums in its first week. The group also released 27 exclusive ringtones through the iTunes Store in 2012, including hits like “Can’t Buy Me Love”, “All You Need Is Love”, “Yesterday” and “Eleanor Rigby.